Begin by preheating oven to 350ºF. Grease four 9-inch round cake pans, and dust with flour, tapping off excess. Combine flour, granulated sugar, cocoa, baking soda, baking powder, and salt into the bowl of a mixer. Mix on low. Add eggs, buttermilk, 1 1/2 cups warm water, oil, and vanilla. Beat on medium speed until smooth and completely combined. Divide batter evenly among pans. Bake until cakes are set and a toothpick inserted into the center of each comes out clean, about 35 minutes. Let cool in pans set on a wire rack for 15 minutes. Turn out cakes onto racks, and let cool completely. While the cupcakes bake, prepare the salted caramel sauce. Pour the sugar into a large, heavy-bottomed pot, and whisk until completely melted. The sugar will clump in the beginning, but don’t worry…it will melt completely with time. Allow the sugar to cook until it turns a beautiful amber color, and has a nutty aroma. I don’t have a candy thermometer, so I go completely by visual cues. At this point, remove the mixture from the heat. Whisk in the butter, then the cream. The mixture will bubble up, so be careful during this stage (I burned my finger!). The last step is to stir in the salt. Let the caramel cool to room temperature.You can store any leftover caramel in a mason jar. It will last in your fridge for about two weeks. Once the caramel has cooled, prepare the salted caramel buttercream. Whip the butter in a large bowl with an electric mixer, until it is fluffy. Slowly incorporate the powdered sugar, adding it in multiple installments. As the frosting thickens, add caramel, salt, and vanilla. Continue to mix, and add cream until desired consistency is reached. 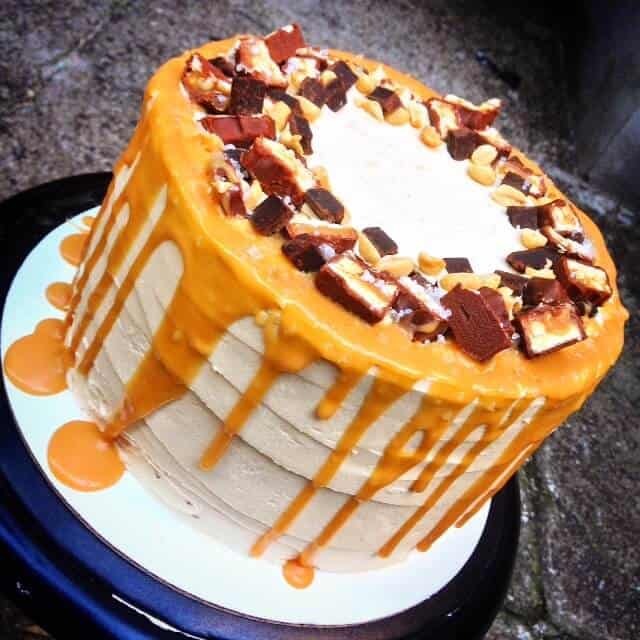 Frost each layer of cake with a thick slather of salted caramel buttercream, a drizzle of salted caramel, salted peanuts, and chocolate chunks. Stack the layers, and apply a thin crumb coat. Refrigerate the cake for 30 minutes, then apply another coat of buttercream. Drizzle warmed caramel over the edges of the cake, and make rim around the top of the with chopped snickers, peanuts, chocolate chunks, and sea salt. hi. When do you add the peanut butter when making the frosting? I add it in with the butter and beat them together! Hi love your tutorials , would this work in 7 inch pans ? yes! The layers will just be a bit taller! Butter or salted caramel ? In the video when the cake is being layered, there is the cake part, a white cream, a tan cream, and then (what looks like) caramel sauce. The instructions and ingredients only have the cake batter, the frosting, and a caramel sauce. Where or what is the fourth thing? Is that the peanut butter -doesn’t look like peanut butter to me. (There is nothing in the recipe of where you put/add the peanut butter in. I just made this and the caramel sauce tastes like butter! (looks more yellowy than the sauce in the video too). Anyone know how to actually make this? The video that pops up is unrelated to this post! 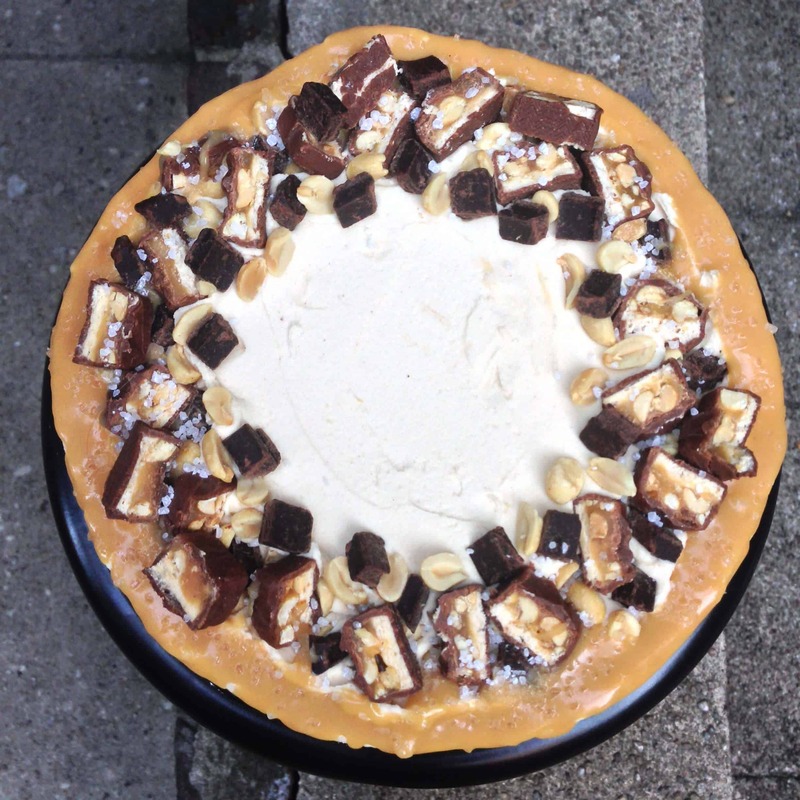 That is a cookie butter cake <3 sorry for any confusion!